Respond quickly and confidently to emergency situations with the only text dedicated entirely to equine emergency treatment. 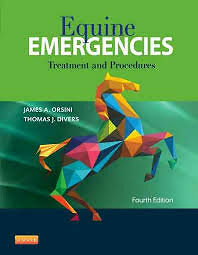 The latest edition of this reliable manual is vastly expanded to encompass a wide range of new and evolving topics in horse care, with thorough, step-by-step procedures for the most effective emergency treatment. Portable for use in the clinic or in the field and presented for the first time in full color, its your one-source guide for complete equine emergency support.